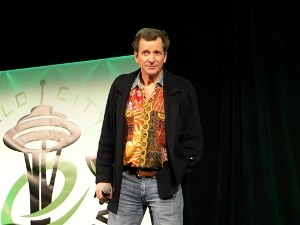 Dirk Benedict was granted a truly memorable introduction at Emerald City Comicon on the closing day of the Seattle convention. 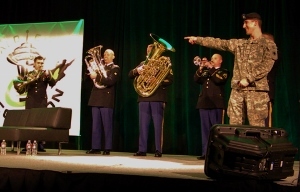 Prior to his appearance onstage for his panel, the 56th Army Band of Joint Base Lewis-McChord supercharged the audience with a live performance of Theme from The A-Team, complete with a soldier reciting the famous opening credits monologue. Benedict, of course, portrayed Templeton “Faceman” Peck on all five season of the ‘80s television juggernaut. It was a truly rousing opening, easily the most elaborate of anyone appearing in the main hall of the Washington State Convention Center over the weekend of March 1-3. The brass ensemble backed by a drummer brought the crowd to their feet with their expert recreation of the famous Mike Post/Pete Carpenter theme. Benedict graciously thanked the musicians and soldier who served as narrator (who presented him with a cigar, “military issue”). Of all the celebrity guests, Benedict turned out to be the wildcard rock star of the convention. The former Faceman and Starbuck in the original 1979 Battlestar Galactica spun so many stories and unleashed so much stream of consciousness philosophizing that moderators Jackie and Bender (co-hosts of the morning show on Seattle’s KISS FM) barely needed to speak. I have more coverage of Benedict’s truly memorable appearance over on The Morton Report, but just couldn’t resist sharing the excitement of seeing Face walk out to the goosebump-inducing musical welcome. Bravo to the brass ensemble of the 56th Army Band.